I know this post will be polarising on a couple of fronts so let’s get that out on the table from the start, shall we. 1. 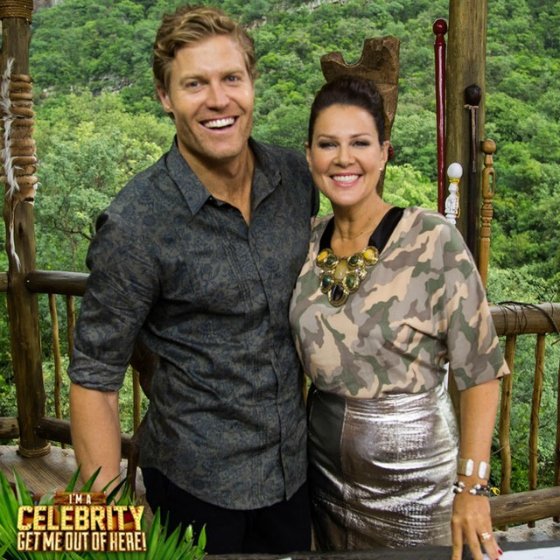 I’ve been watching and largely enjoying Channel Ten’s I’m A Celebrity Get Me Out Of Here. 2. I’m a long-term, card-carrying member of the animal-print appreciation society. Let’s address #1, shall we? I didn’t plan to watch the entire series but that’s how it’s panned out. 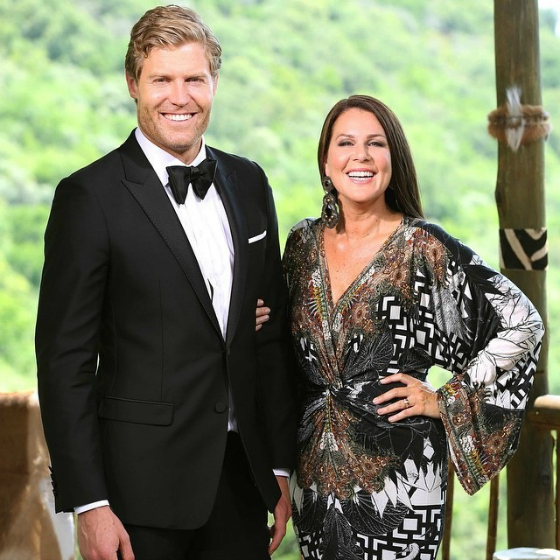 I switched on for Julia Morris (one of Australia’s funniest people) and kept watching for Chrissie Swan (also one of Australia’s funniest people). Before I knew it, the whole family was hooked and so became an almost nightly habit of sitting down after dinner and watching a bunch of people in khaki and red do not much at all except for tucker challenges, which I can tell you should not be watched on a full stomach. Especially those “food” ones. Water cockroaches. GAG. 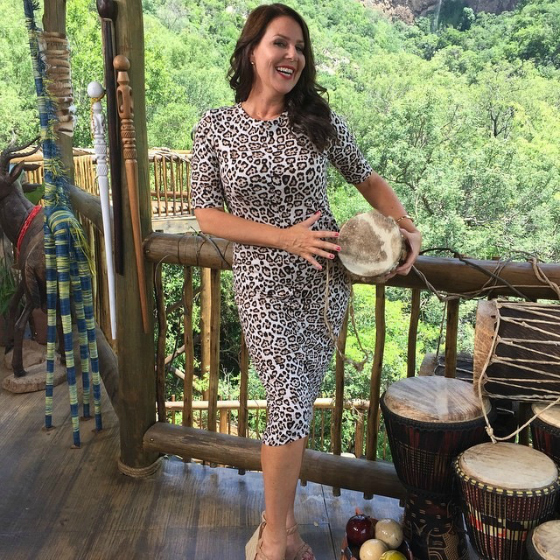 Early on I twigged that Julia Morris’ jungle wardrobe was not some capsule wardrobe packing coincidence. Far from it. 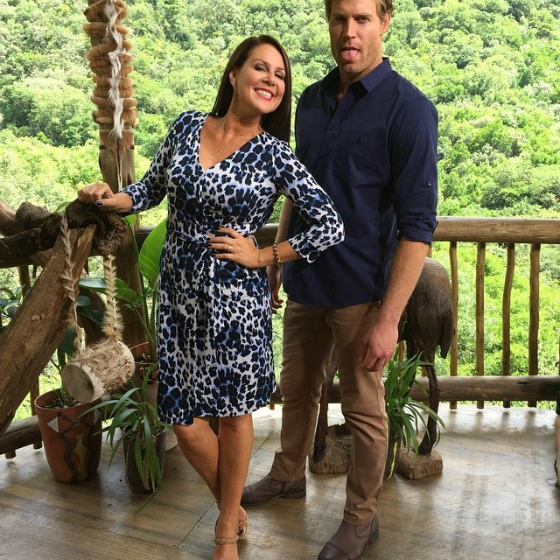 So, I went to the source of her fabulous on-set wardrobe, stylist Anne Stringer (follow her here on Instagram – she’s currently working on the wardrobe for the next Bachelor), for the low down on how it all came about. SY: Who’s idea was it to bring a touch of safari/jungle into Julia’s nightly outfits? AS: It’s a bit of a team effort between Julia, the executive producers and me. Given the fact we are filming in the jungle with wildlife, it was good to make a little play on this and, of course, include animal print, especially leopard. It’s so on trend right now. SY: How do you follow this theme and not have it look cheesy? AS: It’s all about the fabric, silhouette and style of an outfit, dress, top etc. It needs to be tastefully done and age appropriate. No mutton dressed as lamb or cougar looks! SY: Is Julia a fan of all things animal print? AS: Yes she is a fan and she has fun with it. It’s really important she feels comfortable in what she wears. I wouldn’t let her wear anything she didn’t feel comfortable in as it affects the performance. We have used a few items in conjunction with certain episode content, for example the camp is starving and go off to eat insects so I’ll put her in an insect top. Or the camp is doing a challenge with animals so I’ll put her in an animal or leopard item. It’s just a little subtle thing we do. SY: What have been your favourite outfits on Julia? AS: I’ve had so many inquiries about how good Julia is looking and what she is wearing, which is great. I’m loving the figure-hugging dresses: Alex Perry navy leather skin dress with white sleeves (pictured at top); Clover Canyon floral print dress; Witchery leopard print dress (below); Marcs navy safari shirt dress (below). Then there’s the two- piece Safari style – navy Willow skirt with white fitted Marcs shirt; Alannah Hill gold skirt with Little Joe camo top. I love her footwear – her three pairs of Witchery wedges. I had some great animal print stilettos but they get stuck in the mud. Julia has a great set of pins, so it’s good to show them off. SY: What should we all keep in mind when wanting to incorporate a safari/jungle theme into our wardrobes? AS: Wear animal in a subtle way with little hit on a belt, shoe, trim, scarf or cami. Animal print always looks good with denim and white or black. Or make a big bold statement in animal print by getting a good silhouette in a dress, skirt, pant, jacket or top that suits your body shape in a beautiful quality animal print fabric, so it doesn’t look cheap. SY: What are some of the key labels you have worked with for the outfits? Clothing: Alex Perry; Clover Canyon; Witchery; Marcs; Willow; Little Joe; DVF; Desert Road House; Leona Edmiston; Ginger & Smart; Alannah Hill; Country Road; Camilla; Seed; Bec & Bridge; Zara; Saba; Portmans; David Lawrence. Footwear: D Squared; Caterpillar; Timberland; Witchery; Country Road; Tony Bianco. Here’s a sample of some of the fabulous animal print and jungle-inspired pieces available in store now. Yes, I consider animal print a neutral! Want some more tips on how to wear animal print? Check out this post here. Confession time … who else has been watching? Who’s going to win? Who loves a bit of jungle theming in their wardrobe? Can you tell me where Julia got her Leppard print dress she is wearing on the commercial December 2018. Check her Instagram account, Peta! this post is from a couple of years ago. Where can I get the black batwing dress Julia wore ? I swear,the day I turned 40 I started loving animal print – and I haven’t looked back. Now I’ve got it everywhere and I make no apologies for it. I am very tempted to go and grab those Seed pants! I love animal print! As for Julia, how divine us that Camilla kaftan?! I confess- I’m an animal print lover. I also consider it a neutral and I do love to wear a leopard print shoe with my red or blue block colour dresses. I also have the Sportscraft cropped pant that is the same print as the coat you have highlighted, Nikki! A surprise leopard print shoe is always ok in my books Johanne! Love animal print AND the show. Secretly I want my girl crush Anna to win but knowing that she is an intruder means its unlikely. I think it’s time to Chrissie to win. She is just so LOVEABLE. Oh I love Anna too. I’ve met her as we’re Project SPF ambassadors. She is smart and beautiful! Have always loved leopard print-no matter how old I get. Think it can look very classy as long as you are not dressed head to toe in it! Just purchased a leopard clutch from Diana Ferrari which will brighten up my new seasons wardrobe. I agree Joanne … it’s the way you wear it. And the dresses Julia is wearing work as they’re shapely so don’t overwhelm with the print. Hmm ..is it just me or does leopard print scream ‘ look at me, I’m over 40?’ I think Julia looks fabulous , the key message is to choose quality . I am absorbing and learning from Nikki and trying to get my head around an animal print being a neutral! Keeping an open mind. Love this blog and everything SY offers and stands for. Check out how my friend Sonia (blogger Sonia Styling) wears leopard print – she’s 30 and rocks it. I think it’s a personal preference thing and that it can be overdone but when done in a fun/surprise way can be a great outfit statement. Thanks for your kind words Bonnie! I am 31 and love animal print! It has to be classy though or it can look tacky. I think you’d rock everyone of these pieces Ms Sonia (hear you roar) Styling! I can’t bear to watch – the eating challenges make me want to chuck! Julia looks absolutely fabulous, doesn’t she? And those DVF dresses are just divine! I’m not confident enough to carry off an animal print myself but I love the look on other people! I always gag if I watch those too Sammie – the whole family “dines” out on this!! I am loving the show too,except for the eating challenges,which make me gag! She makes me laugh too Lisa!! I absolutely love Julia’s wardrobe on the show! I’m a fan of leopard print and I love how she is dressed age appropriately! I love that Ingrid – so refreshing! 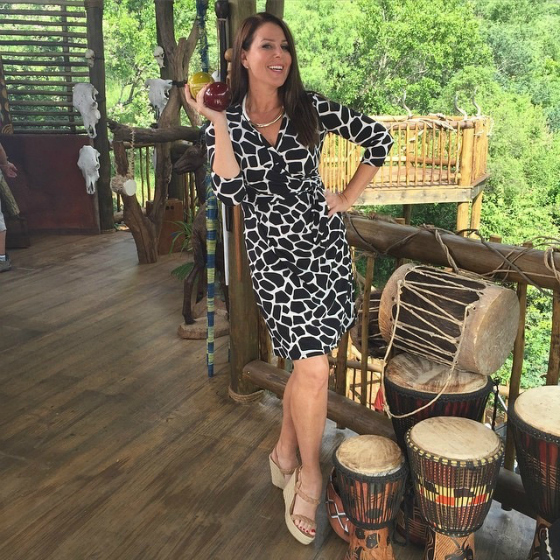 Animal/ jungle prints look fab on @ladyjuliamorris….but she is tall beautiful and riotously funnnnnny…. I’m too short for most looks I but do think DVF dresses are the bomb!!!!!! I don’t think height dictates whether you can wear animal print – it’s more about confidence of doing the print in a dress. For accessories and other splashes of animal print, anyone can add a touch if they so desire. Have loved Chrissie since Big Brother and then she came to live and work on the Sunshine Coast for her first radio gig! The drive to work was never the same after Chrissie left. I’ve always loved a touch of either leopard or wilderness-type theme in dressing – it just adds some style and fun! It’s a great neutraliser while making heads turn! Julia looks fantastic in the photos- haven’t watched the show but obviously great outfits and she really makes it work! So true about it being fun – even wearing the leopard print flats I wore yesterday, it just added a bit of fun to my outfit. I loved that there was a theme going from the start but that it was subtle and consistent. So much wardrobe inspiration! I’m like you Nikki & didn’t intend to watch it but after catching a few snippets got hooked. Have loved all Julia’s outfits – very inspiring for our age group & also that she looks so terrific after her weight battles – hope for me too! Great style ideas for our age group that’s for sure Anne-Maree! My husband and I started watching about 2 weeks into the show and got hooked. Julia and Dr Chris are very funny together and she looks fantastic. The style choices are great, although I prefer it when she stays realistic and wears the sneakers or flats into camp! They are so funny together – Dr Chris has relaxed into it as the show’s gone on too. I think it was great that they showed her wearing sneakers into camp! Not daggy at all Kathryn! Great buy!! I haven’t been watching the show but I am loving Julia’s outfits. She looks amazing! She can certainly rock a body con. Hot stuff! She looks so great in all these styles – they work great for TV too.